So… it’s been a while since I wrote a blog post. February flew by, and March was a time of change. I recently started a new job and I am currently packing for a move at the end of the month. Suffice to say, I’ve been busy. It holds true that Spring is a time of renewal – at least for me. My new job is with New Venture at NAIT. I’m working with an amazing team of people to promote startup culture and support student entrepreneurship on campus. The position marries my passion for working with students and my love for innovation. Dreams. Just last week we hosted our Hatch Startup Challenge Reception, where we awarded more than $30,000 in startup funding to student businesses. The diversity of the applications was impressive! Winners included an aboriginal-run morel mushroom distributor (the stuff is like gold) and a device that keeps pipes from bursting when temperatures drop. Students were also awarded space and mentorship in our Hatchery incubator. I can’t wait to start working with them. The methodology we use in our work to support students is the “Lean Startup” approach. The framework provides a simple and easy way to get business ideas off of the ground. It challenges the notion that businesses need to spend countless hours developing a static business plan. According to the Lean approach, businesses should be treated more like experiments that test hypotheses. Typically, these hypotheses are based on customer feedback. Entrepreneurs should be out surveying potential customers about their experiences to ensure that the business idea is solving a problem. If it isn’t solving a problem, chances are it won’t gain much traction. An innovative idea doesn’t necessarily translate into good business. This system of acquiring constant feedback allows businesses to be nimble and responsive. Part of getting customer feedback involves getting some form of product out to market as quickly as possible. This product is referred to as the minimal viable product (MVP). This process allows businesses to understand what or what doesn’t work with their product. It’s like applying Darwinian theory to the product development process. If a product feature doesn’t serve a purpose, it’s got to go. It also helps entrepreneurs develop a business case when they go to investors for financing. A good example of an MVP is how AirBnB started. The founders didn’t launch their business with a fancy website with all of the features they have today, but rather a simple website that had pictures of their apartment and details on how to rent it. This gave the founders an opportunity to test their product without investing a ton of money initially. Another example of this would be how some restaurants start out by having “pop up shops” before having an official brick and mortar location. Drift Food Truck did this and just recently opened up Dovetail Deli. This type of thinking really appeals to me. Not only because I feel it is a great way to stay fresh and innovative but also because I have tendency to be impatient. Sometimes it’s better to get out there and just get things done. The Lean approach can extend beyond business development. When I reflected on the methodology, I realized that many Make Something Edmonton projects could be considered MVPs. They typically don’t cost much money to get off the ground and they tend to solve a problem the community is experiencing. 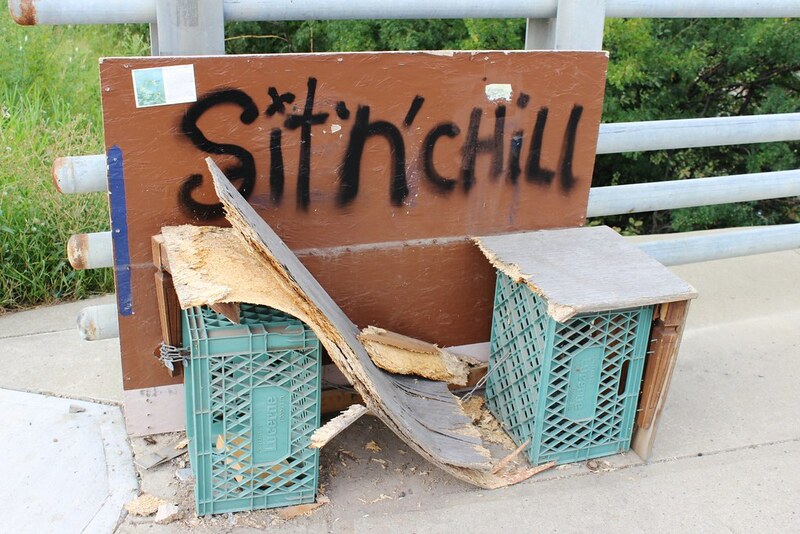 Take the Sit N Chill Bench near the High Level Bridge for example. It was evident that there was a need for a place to rest at that particular location. I’m sure there was a process to request a bench from the city, but I assume it would take a lot of time and paperwork. So, someone took initiative and fabricated a bench made of plywood and milk crates. Then, it broke. And someone else followed up by making one out of concrete. Now we have a beautiful and permanent place to… sit n chill. Last September, I was a part of a group of people who put on the 102 ave Pop Up Bike Lane. In my opinion, the pop up bike lane was an MVP of sorts. It involved pylons and flower planters. I think our budget was roughly around $1000. It didn’t have the bells and whistles of the bike lane that is planned on being built (which I am very excited for), but it had the bare bone features of a separated bike lane which gave people an idea of what the final product could be like to use. I could go on and on. Edmonton is full of ideas and initiatives that could be considered “lean”. Peruse the project section on the Make Something Edmonton website (which is up for a Webby award. Vote here) to see other examples. 1) Do you experience a problem that others experience? 2) Can you think of a simple and easy way to address it? 3) Do it and put your project up on the Make Something Edmonton website. Let me know what you think. I’m curious to hear your thoughts. Also, I was recently interviewed by the Primal Blueprint Podcast to talk about some of the projects I’ve been involved in. Listen here.